When you look up the word ‘funny’ in the dictionary, a photo of Stephanie Jones should be next to it. We’re not kidding; our stomachs ached after leaving her studio. But aside from being incredibly witty, Stephanie, from Stephie Jones Fine Art & Prints, is more notably an extremely accomplished painter. Originally starting in marketing and graphic design, Stephanie had a near-death experience that jolted her to question her profession. While she had a successful career, she realized it was time to pursue her true passion. Stephanie made the brave decision to change her path to involve a skillset that she loved – art. Art fans are glad she made the switch. Stephanie, or Stephie as many call her, started painting her animals with floral crowns pieces and added her Beach Daze and Cactus Love collections within a few months. 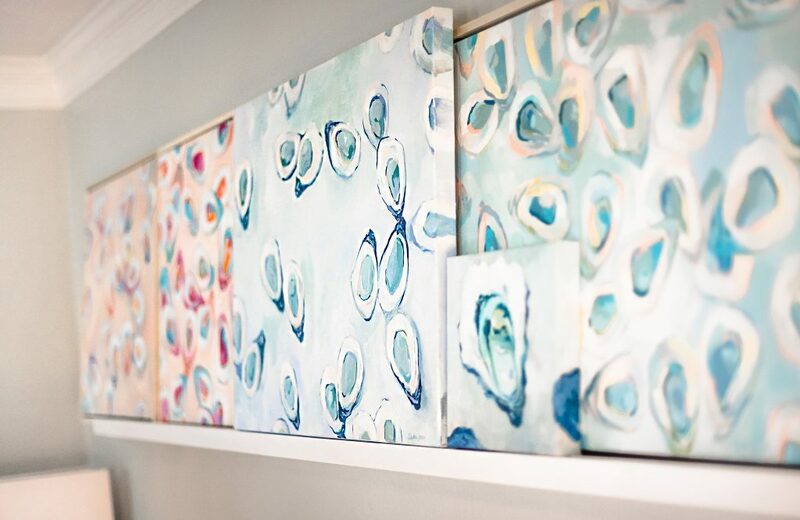 Recently, she unveiled additional Oyster paintings which include a fresh color palette of pinks and oranges. She strives to create artwork that is light, airy and uses ‘happy’ colors. As Stephanie’s career continues to grow, her success presents new challenges for her to face. For example, there’s the constant pressure to produce new works of art. Whether she needs to keep up the evolving industry or give more options to her fans, Stephanie notes that there is a continuous desire to create new collections or add to existing ones. Thankfully, her creative juices are always flowing which allow her to debut beautiful works of art regularly. Stephanie also notes that business owners need to have an intentional plan of growth. “I’m always thinking about ways to plant seeds; I’m going to have nothing in six months if I’m not thinking of something now.” She emphasized planning for the future is crucial to moving your business forward. And she should know. Her planning has led to a lot of recent recognition, from being a featured artist at the Virginia Aquarium’s Annual Commotion in the Ocean Gala, to be a keynote speaker at inaugural VA Beach Public Library / MOCA ArtFest. Over the summer, a piece of hers was selected by Minted.com for national sale. Whether it’s succeeding at making those around her laugh or showing off her incredible painting abilities, one thing is clear – Stephanie Jones is adding an extra dose of happiness to the world around her with each canvas she designs. Be sure to browse Stephanie’s latest masterpieces on her website, StephieJones.com.